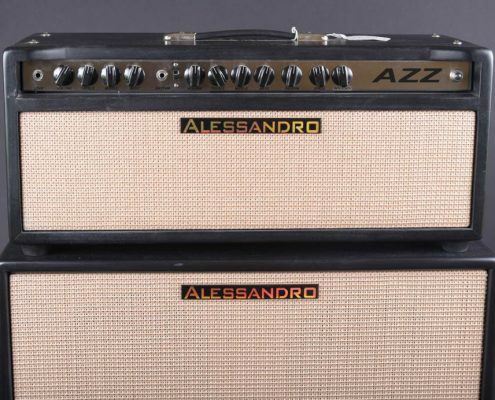 Alessandro’s AZZ series of amps are a relatively new offering from Alessandro High-End Products. The AZZ is designed and built for the discerning, professional musician. Drawing its tone and feel from the most significant amps of yesteryear, the AZZ seamlessly blends its vintage vibe in a form to be used with today’s modern pedalboards. The 1/2AZZ delivers 50 watts with two 5881 power tubes or 90 watts with four 5881s. It features a Lead channel with Volume, Treble, Middle, and Bass controls, as well as a Rhythm channel with identical controls, plus Reverb, Speed, and Presence knobs. The channels are voiced to be layered together, so you can utilize the Rhythm channel full time and then switch on the Lead channel to bring all your pedals and effects on line. This keeps the Rhythm signal path free of tone sucking pedals and cables, and the individual EQ and level controls allow for fine-tuning to get the voices to blend and layer musically. The AZZ series amps are custom-order only, and start at $12,500.